Also at archive.org I found a 1950 US propaganda film about the Korean War called The Crime of Korea, which details communist atrocities (and reflects the worldview of the US government at the time). 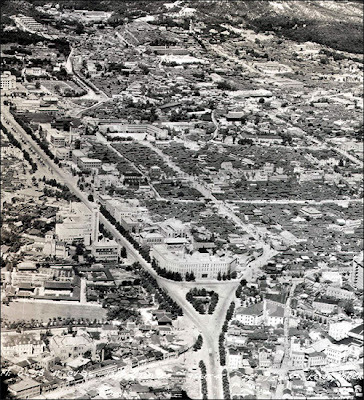 What's interesting is that it begins in 1945, and some footage of Seoul at that time can be seen. 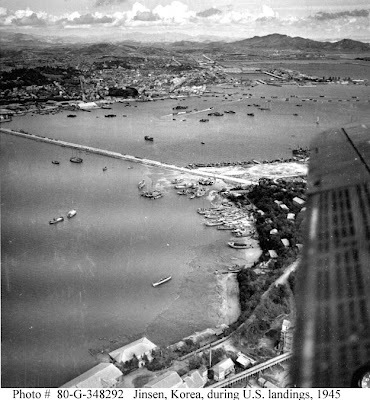 Also, I recognized a number of shots in the film, as they were similar to photos I had seen before, such as the one below, taken in Incheon on September 16, 1950, the day after the Incheon landing. 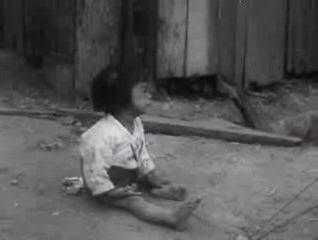 I first saw this photo at the Korean War Children's Memorial website. Sfc Barnes, a. Motion Picture Cameraman and I were looking through Inchon, Korea for pictures when we saw some marines detaining some North Korean POW's. As we started to take picture, we heard a child crying and saw a better picture. The results appear in this picture, which I call "All Alone." 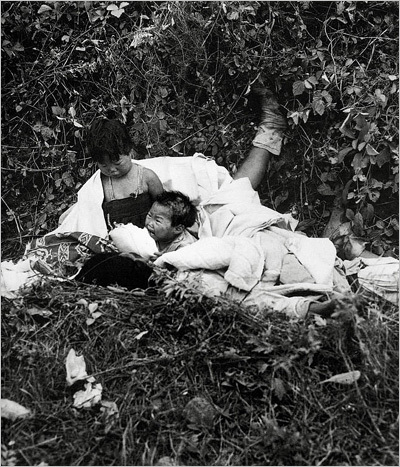 The Chosun Ilbo has some newly released photos from the Korean War, as well as some released last year; among the latter, the first photo reminded me of a passage by Reginald Thompson of the London Daily Telegraph quoted in the book Korea Witness, which perfectly described the photo. One detail is different, however, making it clear that such a scene repeated itself many times throughout the war. I'm quite certain the second photo in this set was taken at the same time as this photo from this post, just before the first and fifth marine corps split up, the first moving through what is now Bucheon towards Yeongdeungpo, the fifth moving towards Kimpo Airport, and the neighbourhood I live in at the moment. I'll post about that in the next day or so. 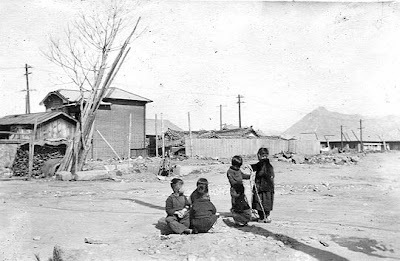 The Passing of Korea and In Korea with Marquis Ito have been interesting to read, as has Fifteen Years Among the Topknots, which has personal observations of Korea's history between 1890 and 1904. Quaint Korea (reviewed in Korea Bug) was written by a women who had never been to Korea (! ); Corea, or Cho-sen, land of the Morning Calm is fun to read, due in no small part to the writer's personality. And that's just scratching the surface. I'll link to more books as they turn up. Seeing as I've talked about development in Bucheon before, I found Joe's photos over at Paint Roller blog taken of (and from the top of) the yet-to-be-finished We've The State apartments in Bucheon to be pretty nifty. Antti's panoramic photos of Busan at Hunjangui Karuchim are well worth a look as well. 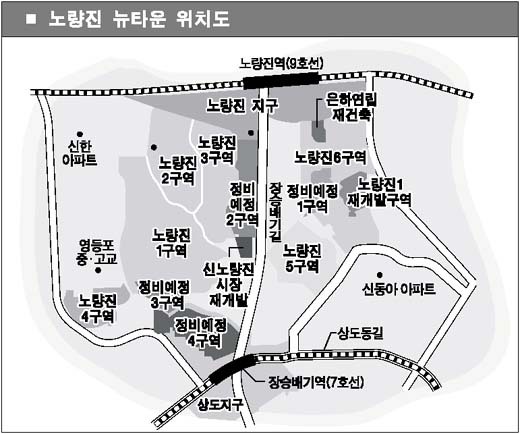 With such neighbourhoods in mind, an article over at the Hankyoreh about the disappearance of Mom and Pop stores (to be replaced by... bars?) and other small business trends is worth a read. Kyle: "Wow, look at all these people playing right now." Cartman: "It's bullcrap! I bet at least half of these people are Koreans." This month is the 20th anniversary of the June 1987 democracy protests, and Kotaji is doing a great job covering them, by posting contemporary day to day reports by British newspapers. They can be read here (with the first post being at the bottom, of course). A bit late in linking to this, but Jamie over at Two Koreas has a post about his trip to the Kaesong Industrial Complex. My camera accompanied him, but it returned without a memory stick (North Korean Immigration seemed to be concerned about photos of (likely non-military) construction sites near Kaesong; someone should have told them "Hey guys, do you have any idea how much of South Korea looks like this?). Obviously, after this outrage I turned in my North Korean Workers' Party membership card. Bastards. Lastly, a (downloadable) full trailer for the film "May 18" can be found here. At the end of this post, I wrote, "It should be interesting to see how the uprising is portrayed now (ten years after "A Petal" and "Sandglass"), seeing how Korea, and how Kwangju is remembered, has changed quite a bit since then." I might have to change that from 'interesting' to 'painful'. Judging from the trailer, it seems someone decided that the "action melodrama" genre would be a good idea, perhaps using "Taegukgi" as a model (ugh). Not really my cup of tea, obviously, but then it's likely a younger crowd they're appealing to, and considering how little even university-aged students know about the Kwangju uprising today, that's not necessarily a bad thing. In all fairness, I suppose the film shouldn't be judged by its trailer. 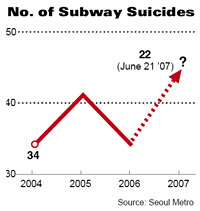 So far this year, a total of 22 people committed suicide by jumping on subway tracks in Seoul and the metropolitan area, according to Seoul Metro and Seoul Metropolitan Rapid Transit Corporation, or about four people a month on average. The number is a 30 percent increase from the same period last year. In 2006, the figure stood at 34. The most recent suicide occurred around 2 p.m. on June 17 when a man in his 30s threw himself onto the subway track at Gunja station on subway line 5. This month alone, five people have killed themselves on subway tracks. There were 21 suicide in subways in 2000, rising to 52 at the height of the recession in 2003. The number dwindled to 34 and rose again to 41 in 2005. This year, it is also expected to exceed 40. That the Korea Times (and the Chosun Ilbo, in its Korean edition) used the graph below to illustrate the projected rise is a bit silly, seeing how, if they had started with 2003, the 2007 figures would still seem low; the graphic doesn't really seem very helpful. The station with the most suicides during the period was Guui Station on Line 2: a total of six people killed themselves by jumping on the tracks there. 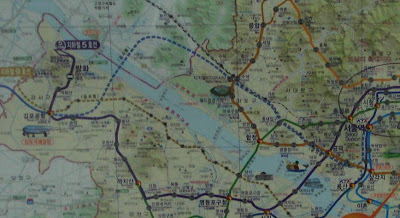 Noryangjin and Songnae stations on Line 1, Kkachisan and Gunja Station on Line 5 and Hansung University Station on Line 4 are also popular with suicides with five each. The common factors are that there are fewer distractions because there are not many passengers, and that they are in lower middle-class areas. I don't know all of those stations, but, to judge by the presence of new apartment complexes nearby, Noryangjin fits that description (not for long though, as a new town is headed its way), as does the Kkachisan Station area (which is also likely getting a new town). Songnae Station in Bucheon, on the other hand, has large apartment complexes nearby, though the husband of a former coworker witnessed a suicide there back in 2002. 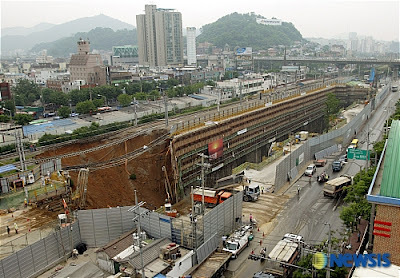 Since the train yards and offices for line 5 are found in Banghwa-dong, I've had several students over the years who worked for the subway in some capacity (as drivers or engineers). One engineer told me that he has to examine Magok station every night to check for structural flaws. What's interesting is that Magok station is in the middle of farmland at the moment, so the station isn't open. According to him, two people have killed themselves there in the past; if you want a station with "fewer distractions" and "not many passengers", I guess it would be hard to beat Magok station (most of the blogs in this image search at naver have some good photos, especially the fifth entry, which shows the station's construction back in the early 90s). Most of the suicides were unemployed or suffered economic hardship. Most were in their 20s to 40s, and men vastly outnumbered women. According to analysis of 300 train suicide accidents from 2003 to 2005, 70 percent were unemployed. Some 216 men committed suicide, three times the number of women, which was 85. By occupation, 24 were factory workers, 13 were office workers, six were public employees, and four had their own business. 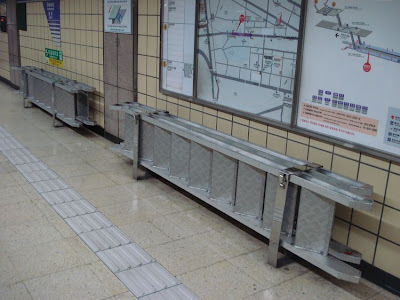 The article goes on to tell us that the appearance of screen doors in subway stations have ended suicides there, but that "Of the 256 stations in Seoul and metropolitan area, only 20 or less than 10 percent have screen doors." You'd think the advertising possibilities these screens present would make them affordable in the long run; when they first appeared at Yeongdeungpo Gucheong station they were covered, for the entire length of the station with ads for a single product. Some experts say changing the atmosphere in stations can also prevent suicide. Dr. Nam Yoon-Young of Seoul National Hospital said, "People commit suicide in places and times when there are fewer people. They could also be discouraged from suicidal thoughts by music or signs." This was taken in Wangshimni station in January; for those with morbid (or sociological) curiosity, a video taken from CCTV cameras is here. In fact, numerous videos of suicides (all blurred) can be found over at naver.com, including one where two men jump down and pull a suicidal man off the tracks seconds before the train arrives. The increasing number of suicides at subways also leaves irreversible trauma to train drivers, which is emerging as a serious social problem, according to Kim Hae-gon, a subway expert. It can't be a very pleasant thing to witness from the driver's seat. 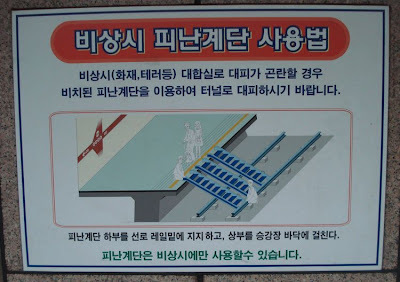 When I was in Sinjeong station (next to the aforementioned Kkachisan station) a few weeks ago I saw these emergency evacuation ladders (which I haven't seen elsewhere) and wondered if they were for people who'd fallen on the tracks, or something of that sort. The guide below suggests that fires or terrorist attacks (etc.) are what whoever put them there had in mind, though it would seem that, according to the stats above, a person jumping onto the tracks is a much more likely occurence than a fire or terrorist attack. One would hope a suicidal person wouldn't use these to make his or her descent onto the tracks that much easier. Robert over at the Marmot's Hole links to a Kyunghyang Shinmun article which shows a few more photos taken by US forces in Korea. 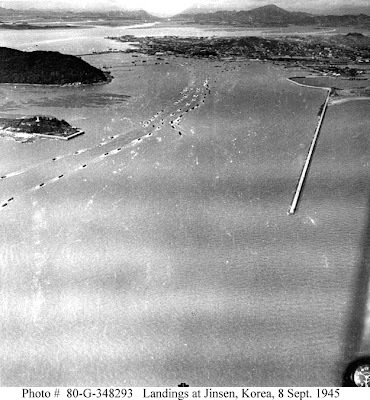 Some 1,056 photos taken by the U.S. Navy for military purposes in late August and early September 1945 of Seoul, Busan, Incheon, Gunsan, Jinju, and Masan were released on Tuesday. They [were] taken on Aug. 28-29 and on Sept. 9-10, right after national liberation on Aug. 15, 1945. Except for Seoul, all the other locations are ports. 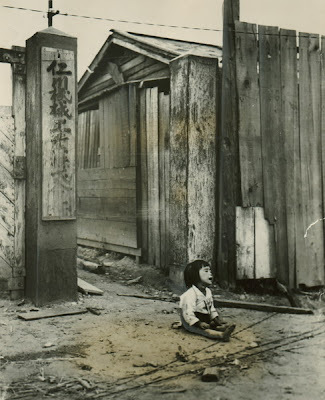 The U.S. military authorities seem to have taken photos of major areas, first of all, to obtain information on Korea after the collapse of Japan. 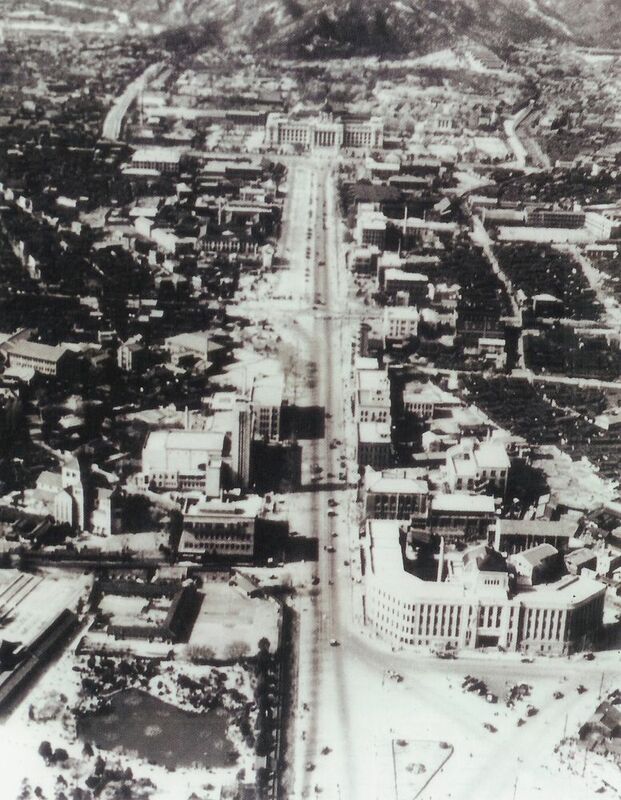 [...] During the colonial era, Japanese authorities also took aerial photos, but only of downtown Seoul. Below are some of the photos. The first looks north, with city hall near the center and Gahoi-dong at the top. 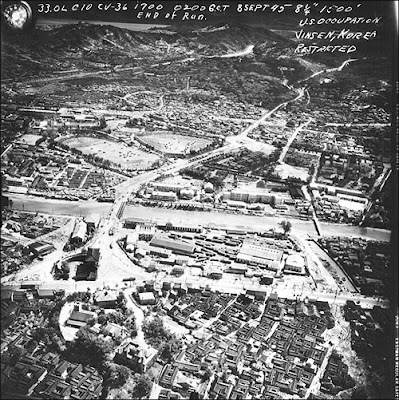 The next photo, though marked "Jinsen" (Incheon), shows the area near Dongdaemun, with the athletic grounds and Cheonggyecheon visible (as well as the Han River, at upper left). Finally, there was the problem for the occupation force of finding any information about the country they were to occupy. One of the few sources of intelligence was the Joint Army-Navy Intelligence Study of Korea (JANIS 75), which had been published in April 1945. This document contained some useful data but was superficial. Korean prisoners of war captured on Okinawa were interrogated and provided a small amount of additional information. 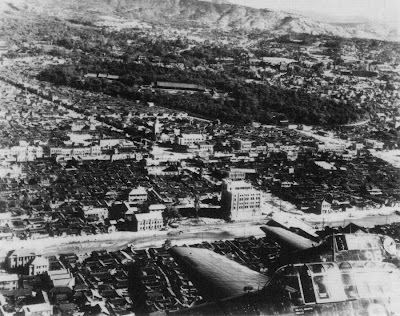 Since the situation in Korea was obscure and General MacArthur wanted to avoid any incidents prior to the occupation, aerial reconnaissance of Korea was forbidden. 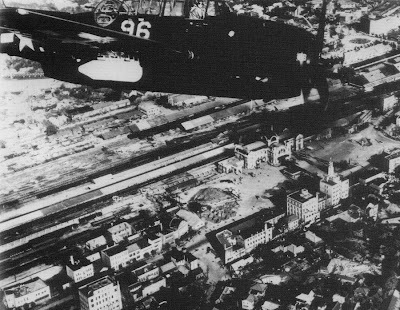 However, some recent prints of aerial photographs were discovered, and the XXIV Corps staff persuaded an Army Air Force reconnaissance squadron on Okinawa to fly a few photographic sorties. The resulting photographs, although inadequate for combat operations, were useful for planning the deployment of the occupation troops. Thus, in the absence of any more authoritative information, the former anti-aircraft gunners of the newly formed Military Government Headquarters planned for the occupation of Korea using War Department field manuals, some illicit aerial photographs, the Cairo Declaration, and JANIS-75. The occupation force arrived in Incheon on September 8, 1945, and its arrival and the ceremony in which the Japanese turned command of Korea to the US can be found here. In the two views above Wolmido and its causeway can be seen, as can the long line of US ships entering the harbour - a scene which would repeat itself five years and one week later. One of the nice things about the internet, of course, is that you can find pages like this, where soldiers involved in the occupation share their memories, as well as their photographs. 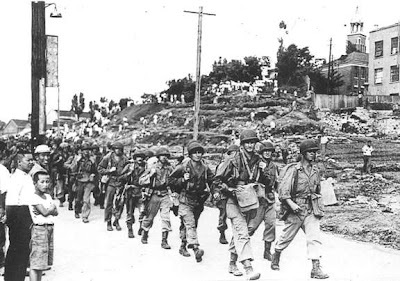 Below, US soldiers march through Incheon on their way to Seoul on September 8. When it was known US troops would soon arrive at Incheon, Koreans set out to welcome them, but Japanese troops fired on them, killing some. 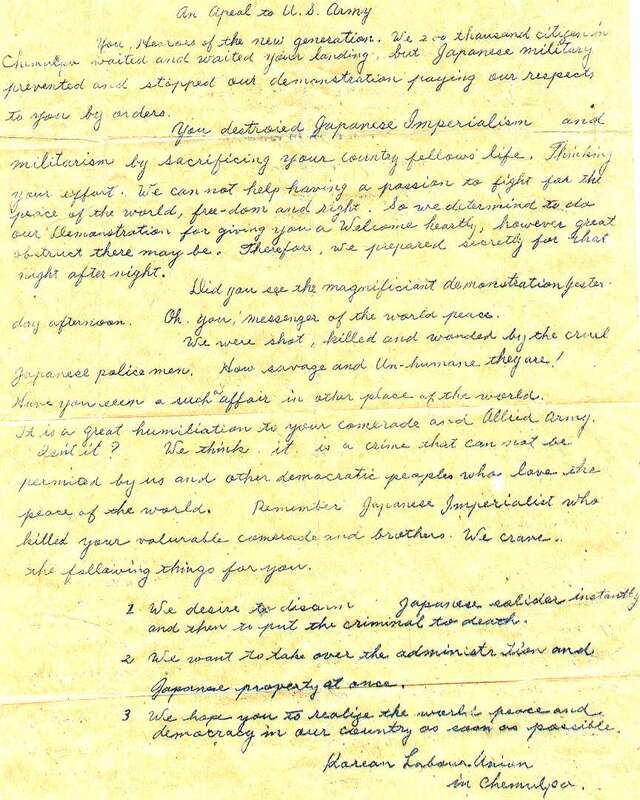 When the US troops arrived, they were given a message explaining these demonstrators' position, which can be read here. 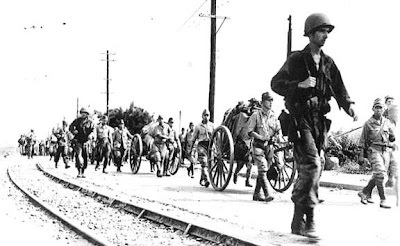 After the surrender ceremonies in Seoul and the disarming of Japanese troops, US troops accompanied the Japanese to the ports for return to Japan. Another page with the memoirs of a US soldier can be found here, but the final one is really well worth looking at, because his hobby was taking photos of people and places in post-liberation Seoul, and a gallery of his photos can be viewed. 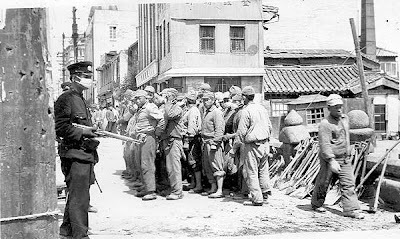 The photo above is labeled "Korean policeman and Japanese war prisoners", and is interesting because it begs the question of when a certain amount of authority was turned over to Koreans (especially considering how Japanese soldiers had fired on the crowd at Incheon before the US troops arrived). The line running south from Jongmyo was "originally reserved for the deployment of US forces at the end of the Japanese colonial period," which may explain why a photo was taken there (I'm quite certain the photo above was taken there, near Namsan). This strip of land was eventually turned into the Sewoon Sangga, which will soon be redeveloped, as I've mentioned before. 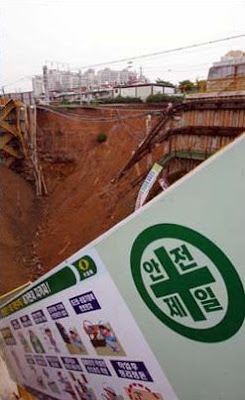 Jon over at I'm a Seoul Man has a post about the collapse; he also has a photo of the same construction site that he took before the collapse, which looks pretty cool at full size. His post made me aware that the Chosun Ilbo and Korea Times both have articles on the collapse as well. 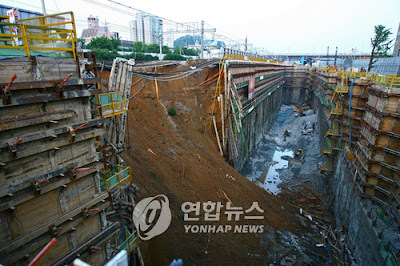 On Sunday afternoon, two sections of track near Gajwa Station in Seoul, midway along the line, caved in, falling 50 meters to the ground and cutting all rail traffic between Seoul Station and Susaek Station. I'll get to why this happened in a minute. The main concern was the traffic jams being caused by the severing of this commuter line. Those who ride the train from Munsan as well as Paju and Ilsan, both in Gyeonggi, were hit the hardest. It took many of them longer than usual to get to work as people scrambled to use alternative transportation. Photographers got the chance to photograph crowds of people waiting for buses in front of Susaek Station. Of course, they might have had other, more horrific photos to take had things not turned out as well as they did. 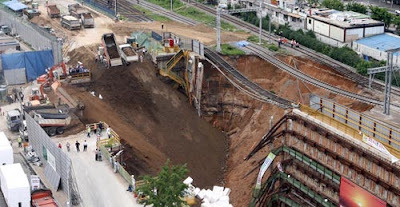 A train carrying around 150 passengers passed the accident spot seven minutes before it collapsed, even after the Korea Railroad Corp., the state-run operator of the railway, was informed that signs of a railway collapse were appearing just 17 minutes before the accident. Ssangyong Engineering and Construction, which was in charge of the project next to the railway, said it detected an impending collapse at 4:30 p.m., 44 minutes before the accident, and withdrew all of its workers from the construction site, according to police. Police said the company informed the Korea Railroad Corp. at 4:57 p.m. Thanks for waiting for 27 minutes, guys. Of course, the Korea Railroad Corporation almost ended up making quite a mess of things itself. But the railway operator allowed trains to keep running, merely slowing their speed to 20 kilometers per hour, police said. Of four trains passing the accident spot after that, two were carrying around 150 passengers each. Blind luck seems to have saved Seoul from another Seongsu Bridge-like disaster. The construction crews unsurprisingly worked quickly to fill in the hole near the collapsed section of the wall. 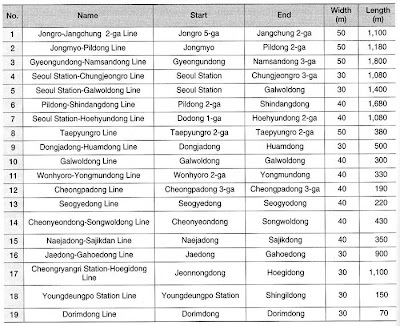 As the Joongang Ilbo shows us, one track is now open, though it will take two weeks to completely repair it. As to why this happened, read on. Police said the accident happened after retaining walls on a subway construction site next to the railway collapsed, spilling sand under the railway into the construction site and collapsing the track bed.